As software engineers, we need to have confidence that the solutions we put into production are of the highest quality. This not only allows us to sleep better at night, but it’s important for the business to have faith in the quality of the product. One of the most effective ways to ensure a high quality is by writing software in such a way that it can be properly tested. For the past year I’ve been using Golang almost exclusively. It has all the perks you want from a compiled language. It’s fast, compiles to a fat binary, and strict type safety. However, writing testable code requires you to break your software down into logical pieces. 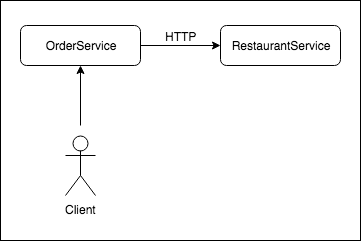 Let’s look at an example of a service we would find in a microservices architecture such as the one at Deliveroo. Obviously this example is greatly simplified and does not accurately represent a system at Deliveroo. The code referenced in this example is available on Github. Please feel free to clone the repo and follow along. In order for web services to be testable, we need to layer the design in a way that makes sense. The idea is to separate the concerns. Dependencies should be interfaces rather than concrete implementations. // Order is the model representation of an order in the data model. // Orders is a slice of Order pointers. // stored in the RestaurantService. // Restaurants is a slice of Restaurant pointers. The repository layer is responsible for connecting directly to the database to retrieve and/or modify records. // OrderRepository is the interface that an order repository should conform to. We have defined only one method on the repository, FindAllOrdersByUserID which will return all orders made by a specific user. // orderRepository is an implementation of an OrderRepository. Now the repository layer is tested and we can start to build on top of this foundation. We only have one external API client, to make calls out to the RestaurantService. // Client is an interface that describes a RestaurantService client. From this we can see that it has only one method and returns a slice of restaurant objects when given a slice of restaurant IDs. // client is an implementation of a RestaurantService client interface. // SetBaseURL overrides the default base URL for the restaurants service. // using a slice of integer IDs. The services layer is responsible for the business logic of the application. The service layer will delegate to the repositories and external API clients in order to focus on the business logic. // OrderService represents the business-logic layer for Orders in the system. The interface again has only one method. This service will be responsible for retrieving the orders from the OrderRepository, augmenting the order data with the restaurant data by calling out to the restaurant API client, and then returning the result. From the code we can see that the orderService calls out to the FindAllOrdersByUserID method of the OrderRepository, then calls out to the restaurant Client and combines the two results before returning the result to the caller. At this point we need to start talking about how to generate mocks. My preferred mocking library is golang/mock. Take particular note of how the OrderRepository and restaurant Client is mocked out in the tests. By depending on interfaces and not concrete implementations, we are able to mock out these dependencies in order to allow the code to be tested. The handler layer is responsible for parsing a request, calling out the the relevant service and then returning a response to the caller. // SetOrderService sets the OrderService dependency on the Provider. Notice how the OrderService is held as an attribute on the Provider. This is done so that the order service can be mocked out in a test. // FindOrdersForUser gets the orders for a user from the user's ID. Notice that the FindOrdersForUser accepts the generated Context interface and not the standard *gin.Context. As software engineers, we should ensure that our software is well-tested in order to keep the quality bar as high as possible. In order to write code that is testable, the software should be divided up into logical layers with a separation of concerns. The different layers should interact with each other through interfaces rather than through concrete implementations. Mocks can be generated using tools in order to speed up development. By using a test suite, interfaces and mocks, we can ensure a high quality of our software by having good test coverage.